The Brony Fan Fair's decision to release a promotional visual novel is rather unusual, but we don't really mind since the Brony fandom doesn't have enough VNs aside from the upcoming Starswirl Academy and that other one which should not to be named. Still, it is a relatively low-risk decision on their part, as the number of guests is unlikely to be affected negatively by the game's quality unless it turns out to be grossly offensive. Even then it would probably still attract folks looking for a cheap laugh, but the game isn't that bad...right? Our review can be found after the break, as usual. 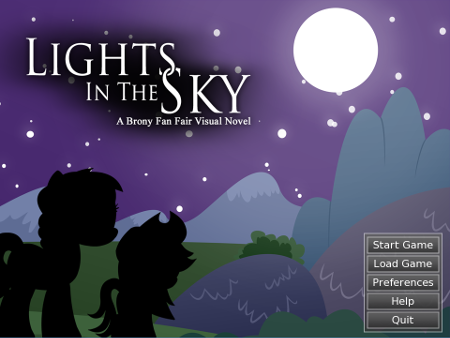 As is to be expected from this type of fangame, Lights in the Sky is fairly short when compared to commercial visual novels or its bloated sibling (most of you should be familiar with the game I'm referring to here). This is probably for the better, as the plot is relatively simple and would have felt stretched out had it been much longer. As for the story itself, it is told from the perspective of the convention's mascot, Rising Star, as her elder sister takes her to an astronomy museum to deliver some starfruit to a loyal customer, and various somewhat unexpected events ensue. According to the press release the game was developed with a younger audience in mind, so you won't find any Story of the Blanks references in here. Sorry, creepypasta fans! Of course, the most important element of any visual novel is the quality of the writing, and Lights in the Sky performs quite well in this regard (especially since it was made as a final project for a "Writing and Narration for Video Games" course at the University of Texas). As the course's teacher puts it, "...[A]s a work of interactive fiction -- from what I've seen -- it succeeds on every level. There is conflict, exploration, a sense of adventure, and the writing always stays safely in the established My Little Pony universe". I would have to agree with him for the most part, although the designated antagonist is surprisingly unintelligent for a colt reading books on astrophysics due to the requirements of the plot. There was also little time to flesh out the main characters: hopefully future installments in the series will correct this flaw. Contrary to what some rabid Filly Gamez fanboys have claimed, graphics are fairly important to a games of this genre; after all, it is a visual novel, not a choose your adventure fanfic. In this area Lights in the Sky is decent for a fan project, aside from some tacky gradients and odd character colourations. The use of Pony Creator for some side characters was also rather jarring when placed alongside more traditional ponies. If only that tool hadn't gained so much attention, then perhaps the internet would have been spared the abominations that it generated... 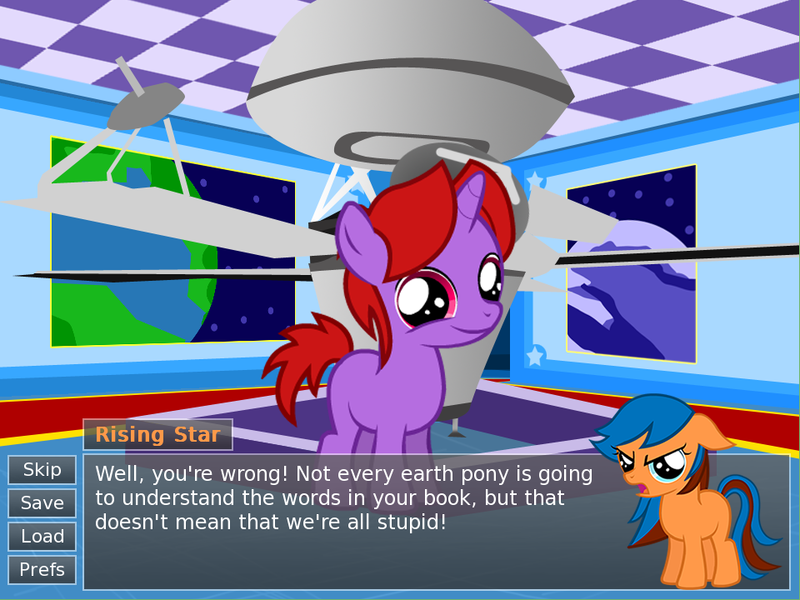 Anyhow, this is supposed to be a Lights in the Sky review, not a rant about how much I dislike Pony Creator. On a more positive note, that planetarium looked pretty cool. Take a hint, aspiring fangame developers and artists: if you want your game to look good, please don't use that gradient tool. It may be convenient, but it doesn't look very good in My Little Pony's art style. As for the music...it's taken from RPG Maker, but it does the job well enough when it comes to setting the mood. I would have complained about the lack of an original soundtrack, but stock music and sound effects aren't nearly as big of an offense as only using sample sprites. Musicians are harder to come by than artists, after all. To be honest with you, I don't think I should really put a score on this. For one I'm not really a visual novel critic (as the above review made clear), and this is more of a promotional game then anything. It's not really great or anything, so it's still worth your time: just don't expect to get much replayability out of it. Have any feedback of your own? Post them in the comments, or send them directly to the creator at @PeterCJiang. In the meantime, I'll be setting up my new Windows 8 box (and playing Lego Racers at 1080p).